Hello Lovelies, Let's talk about my new beauty product I added to my skincare routine. 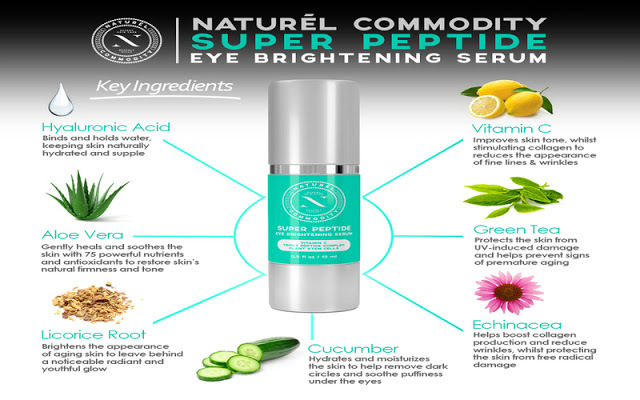 I started using Naturel Commodity Super Peptide Eye Brightening Serum about a week ago. This product claims to work to fight dark under eye circles, under eye bags and help combat wrinkles. It also claims to be a collagen booster. Being in my early 30's and working long hours with little sleep than I care to admit to, I need an eye serum that will give me the "wake up" look that I need. I barely have dark circles, but I might suffer from puffy under eyes once in a while when I sleep for 4 hours or less. (Bad habit, I am not condoning less sleep. 7-8 hours of sleep is ideal). Naturel Commodity Eye Serum is packed with some of the world's best ingredients such as Vitamin C, Hyaluronic Acid, Green Tea, Aloe Vera and Echinacea. I have been using the serum for about a week now. I have noticed that the skin under my eyes is firmer when I use the serum, and I don't wake up with puffy under eye; this is great. I use the serum twice a day, once in the morning and an hour before I go to bed. 1. Wash my face with my favorite facial cleanser. 2. Apply my face treatment serum. 3. Dab a small amount of Naturel Commodity Eye Serum under my eye. 4. Use my SPF 30 moisturizer during the day/ or a night cream at night. It's that easy. You can apply the serum under makeup. The serum comes in an air-tight pump which helps to keep the product fresh from the first drop to the last drop. The air tight pump contributes to keeping the serum fresh and potent and prevents oxidation. This serum is light in consistency, It sinks into the skin fast, and does not leave a greasy finish. It is perfect for all skin types. I have not had any skin irritation since using it. 1. Hyaluronic Acid ~ Binds and hold water. It Keeps skin naturally hydrated and supple. 2. Vitamin C ~ Improves skin tone while stimulating collagen to reduce the appearance of fine lines and wrinkles. 3. Aloe Vera ~ Greatly heals and soothes the skin with 75 powerful nutrients and antioxidants to restore skin's natural firmness and tone. 4. Green Tea ~ protects the skin from UV-induced damage and helps prevent signs of premature aging. 5. Licorice Root ~ Brightens the appearance of aging skin to leave behind a noticeable radiant and youthful glow. 6. Cucumber ~ Hydrates and moisturizes the skin to help remove dark circles and soothes puffiness under the eyes. 7. Echinacea ~ Helps boost collagen production and reduce wrinkles while protecting the skin from free radical damage. 5. Revitalizes to help eyes look more youthful and radiant. As with all beauty treatment products, you have to use "said" product for 4-6 weeks or more to see maximum results. Same applies to this eye serum. What is your number one summer beauty product?